This time last year we were talking of having had English Asparagus at the beginning of April, only for it then to be hit by late frosts. This year we collected our first Kent-grown crop last week. Despite it feeling late, it was around St George’s Day which is the traditional time for starting to cut the crop. It’s hard to resist people’s desire for earlier harvests but nature knows best and this year’s first cut of English Asparagus from our preferred grower was definitely worth the wait. April passed in the UK feeling very similar to March. Save for a few days of warmth mid-month, conditions have been unseasonably cold in most of Europe delaying spring planting. 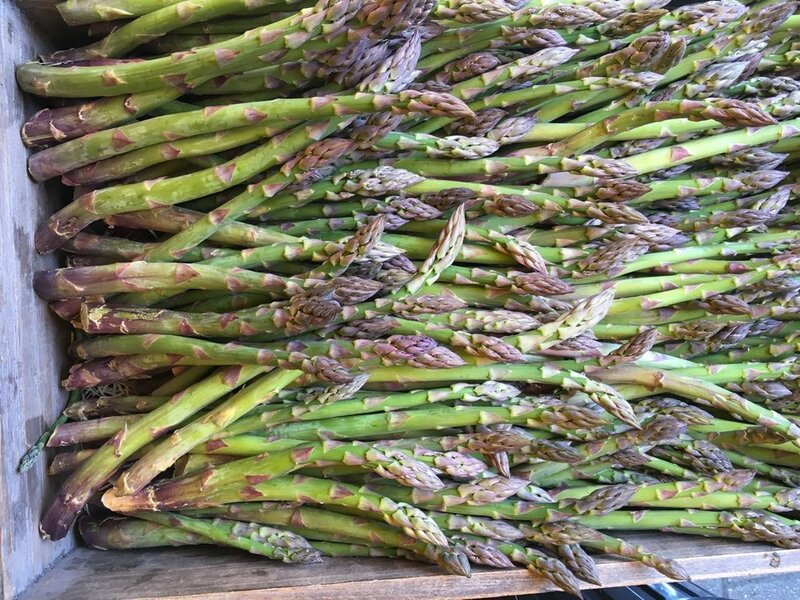 Italy did provide us with Broad Beans, Peas and Cucumbers; France delivered Wet Garlic and Fraise Clery Strawberries; and the UK produced Jersey Royals, Wild Garlic, Sprouting Broccoli, field-grown Rhubarb and the first good Asparagus. A burst of sun arrived in the form of Mangoes from India, including Alphonso. We are definitely overdue some good growing weather. Earthy, saline Jersey Royal Potatoes and versatile Cypress Potatoes. Vitamin C, iron and calcium-rich Spring Nettle Tops, both English and French (bag with care!). Some late English Wild Garlic leaves. Watercress from our preferred English grower, Kingfisher. UK-grown sweet, juicy Cucumbers and mild, crunchy Spring Onions. From Italy, Romano and Tondo Courgettes. Wispy Wild Asparagus and Bruscandoli (hop shoots) from Italy. From our Kent Grower, English green Asparagus, both fat-speared and thin sprue, tasting really delicious this year. Also European purple and white Asparagus varieties. New Spring season Rainbow Chard from Italy. Italian Peas and Broad Beans. Fat, sweet, stems of Wet Garlic from France (don’t forget most of the stalk is useable too. Outdoor-grown Rhubarb, picked up from our preferred farmer in Kent who also grows our Asparagus. Strawberries this week are from France and Italy. We expect English ones in a couple of weeks’ time. There are French Heritage Tomatoes along with large Pineapple Tomatoes, and the salty, crunchy Marinda and Camone Tomatoes that have seen us through winter are still with us. Cool weather harvests of bitter Radicchio and Chicories like Puntarelle and Cime de Rapa from Italy are still with us and there are Tropea Onions. New season Aubergines from Italy are now coming in more variety of sizes and shapes. Green and Purple Artichokes, large and small. St George’s Mushrooms again (one thing that wasn’t late this year) and Morel Mushrooms too. As always, we have seasonal herbs but we have pots of growing Spring Herbs as well. 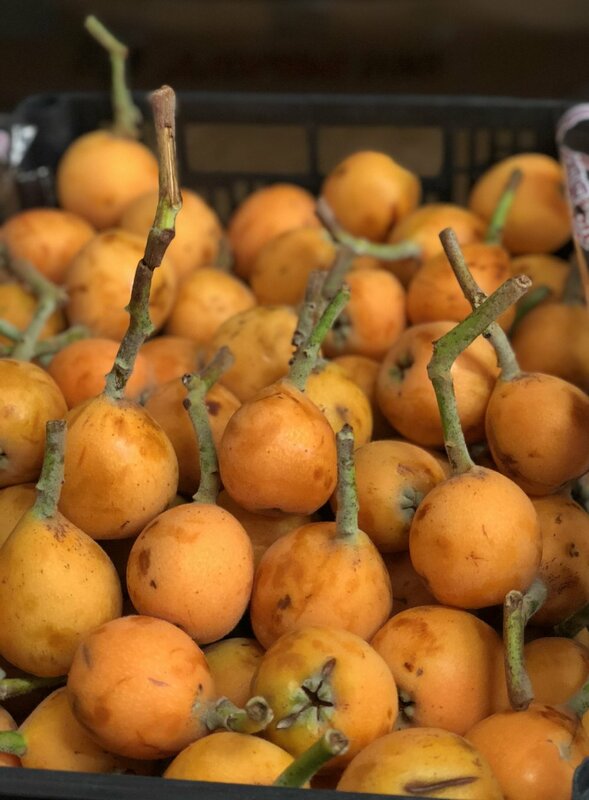 It’s a lean time for European fruits but the Nespole from Italy are in. So, what produce can we expect to come through our doors in MAY? Earthy, saline Jersey Royal Potatoes and some French new potatoes too. UK-grown sweet, juicy Cucumbers and mild, crunchy Spring Onions will continue. Ridged Cucumbers for preserving from Eastern Europe. Increasing varieties of Courgettes from Italy. Wispy Wild Asparagus from Italy. From our Kent Grower, English green Asparagus, both fat-speared and thin sprue. Also European purple and white Asparagus varieties. Fat, sweet, stems of Wet Garlic from France (don’t forget most of the stalk is useable too). Strawberries from France and Italy. Early English ones from our favourite grower should be with us by the third week in May. French Heritage Tomatoes, large Pineapple Tomatoes and, hopefully, some other interesting varieties. Italian Tropea Onions and French Grelot Onions. New season Aubergines from Italy in a variety of shapes and sizes. Seasonal herbs including pots of growing Spring Herbs. It’s still a lean time for European fruits but expect Nespole from Italy throughout the month. Nespole have arrived from Italy. In early spring, just as our stores of apples are emptying and before strawberries come good, they are a welcome sight. Looking a little like apricots, they can be smooth or slightly downy-skinned and vary from yellow to orange. They have a succulent flesh, a little tart, a little sweet with a tropical fragrance. They are a fragile fruit that keep only a couple of days at room temperature but up to a week in a cool place. They can be poached in sugar syrup and simply served with yogurt or ice cream, or added to a fruit salad. Under-ripe fruits make good jam and jelly, or chutney which goes well with fatty meats like roast pork. We collected the first cut of English Asparagus from our Kent Grower last week and, despite a return to lacklustre weather, the English season is definitely under way. Here is a recipe, inspired by our friends at 40 Maltby Street, celebrating the early spears which are delicious eaten raw. It also makes a few spears go a long way. Snap the tough ends off the asparagus. Cut a diagonal slice off the bottom of each spear then slice them thinly. Add salt and pepper to the lemon juice and mix. Whisk in the olive oil to emulsify. Toss the sliced asparagus and the pea shoots in the dressing. Pile onto plates and serve. (Add a few curls or a grating of Italian Parmesan or English Berkswell cheese if you like).